Rated 5 out of 5 by HorseDancer1 from FUN GAME! I always turn off timers as I HATE being timed, and you can play this game just fine with the timers off. They have lovely graphics that play just fine on my old laptop. I really liked their power-ups, and building the temples was a fun step. Some levels were a bit of a challenge, which I really enjoy. All in all, a very nice match 3 and build game!! Rated 5 out of 5 by ecblisa from Very good game if you stick with it I finished the 80 level of this game, and have to say it is definitely addictive once you get past the admittedly dull early levels. The power-ups are varied and interesting, and at advanced levels, choosing the one to use is a lot of fun. The game is not great at explaining that you need to build the various altars, but once you click on the bare building sites, you will get a box showing the cost and benefits (more power-ups) of each. As a match-3 addict, I found this game fun and different. I do admit the music leaves a lot to be desired, but I have no problem turning it off and playing my own. Rated 5 out of 5 by sealsbroken13 from I like it. I like it think I will buy it. It is like the other two said,but if I want it to be real hard there are plenty of match three for that, I just want to relax and not get frustrated, I am not a little child that needs to prove I can beat a machine. So if your looking to have some fun want to listen to great game music and play a game for what it is meant for to relax and have some fun then this might be a game for you, if you need to be frustrated and need the I'll get you mentality then this will not be for you unless it becomes that after the trail period. 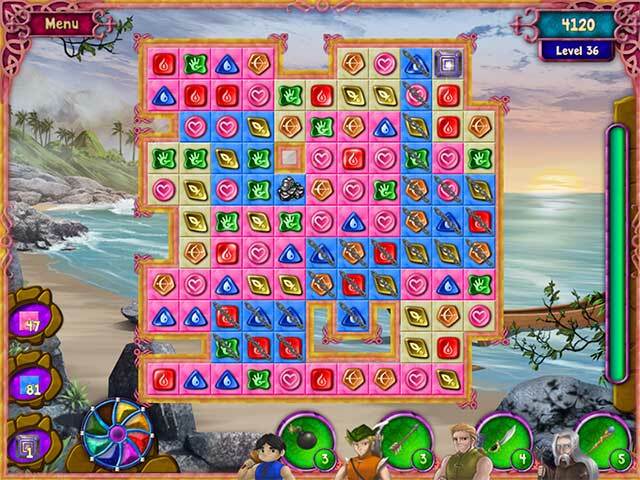 Rated 4 out of 5 by squiggles55 from too easy I love Match 3 games, but was disappointed in this game as it was too easy. I didn't even need to use any powerups to assist me through the levels and I still had plenty of time to finish every level, before timer ran out and this was on the timed games. Rated 4 out of 5 by Mavarnee from It's a 4 with reservations It begins with a story line, but never goes anywhere with it. So don't get it if you want a story. As match 3's go it's pretty good. There are plenty of power-ups to assist you, but I rarely used them, otherwise it'd be way too easy and there's be no point. So I enjoyed making my own matches and working around tight spots with only an occasional assist. The end is abrupt. You complete the last altar and it's done. No "Good job" or "You saved us". I played a bit more to see if there was another level, but no, that was it. Strange. 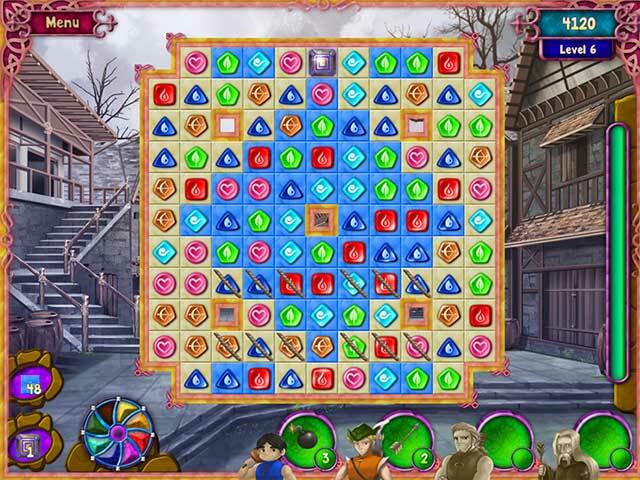 Rated 4 out of 5 by RevKellie from Relaxing and cute, low maintenance game The Game is a throwback to early Match 3's. It sort-of has a story, but is mostly 80 screens to clear. Very relaxing and easy going. Pros: Bonuses are plentiful and nothing is too challenging or hard (also a con), cute set up about building altars to trap magic, music is rousing and cheerful. Cons: The game sticks sometimes so the falling action makes it hard to plan next moves. Although it starts with a story, it really doesn't develop into much more than repetitive screen jumping. There are too many bonuses so the challenge is lost, and the game ends abruptly. Overall, if you're looking for a game to move some tiles around while you watch for TV or wait for a bus - this one will do. Rated 4 out of 5 by pennmom36 from Gallant The Adventurer Wizards have been battling for centuries and cheating chaos, so a group of wizards called the Ancients decided to weaken the powers of those wizards. This eventually put an end to the constant battles. Peace had been restored to the village until Irimant the Warlock sent his minions in search of the crystal of magic. 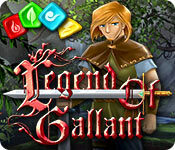 With this powerful tool in hand, Irimant would be unstoppable, if it weren't for a brave warrior, Gallant the Adventurer! 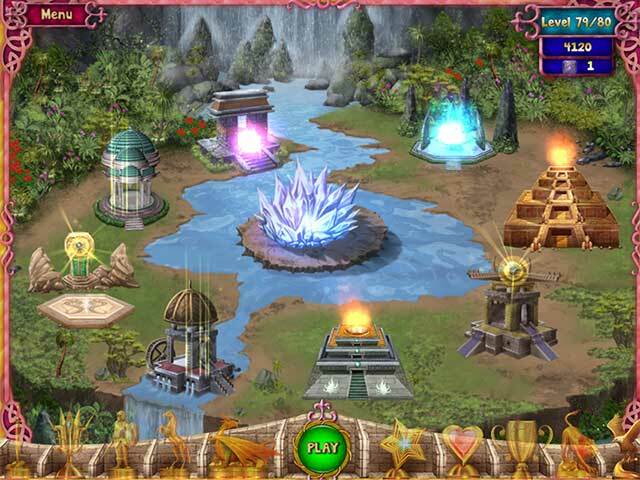 Together you must build 8 Altars from a rare material known as Mithrium Stone, and summon the Ancients once again. At first, I thought there was very little challenge offered in this Match 3 game, but the longer I played it, the more challenging and addicting it became. Each match of 3 or more, charges your amulet that can then be used to unleash it's fury as it targets random tiles all over the board. When you make larger matches of at least 4, you will get a bonus such as a fire bomb, or lightning on the board which can then be used to destroy tiles by simply sliding the bonus to an adjacent tile. Every level requires you to collect one Mithrium Stone by making matches underneath the stone until it reaches the bottom and drops off. You will also need to clear all blue tiles by making matches of at least 3 on those tiles. The Mithrium Stones that you collect will be used to build sections of the eight altars, the Altar of Light, Eternal Spring, Silver Ice, Moonlight, Fire, Water, Kings, and the Eastern Desert. Each section you build will give you a bonus such as a Bomb, an Arrow, a Rocket and a Staff, and once you build that section and receive that bonus, it will be upgraded with each new level. This game has the usual blocked tiles that require you to make at least one match of whichever tile is blocked. I liked the feature that some of those blocked tiles (with ropes and vines for example) moved, they would actually drop down if matches were made underneath them, which can be quite tricky, especially if they land in a cubbyhole, to make matches. Give this game a chance, it does become more interesting as you progress. This game can also be played in a Relaxed, untimed mode, enjoy! Rated 3 out of 5 by mirror75 from Average If you really like M3's, sometimes you have to go with a lamer one just to play because you've played all the other good ones. Such is the case here. Graphics are grainy, nothing impressive to see anyway. There are 80 levels. You can save up your bonuses but if you get to the last level, you can't play anymore so no point in saving them. This was just a very average M3 game. It feels old, like it could have been release 5 years ago.